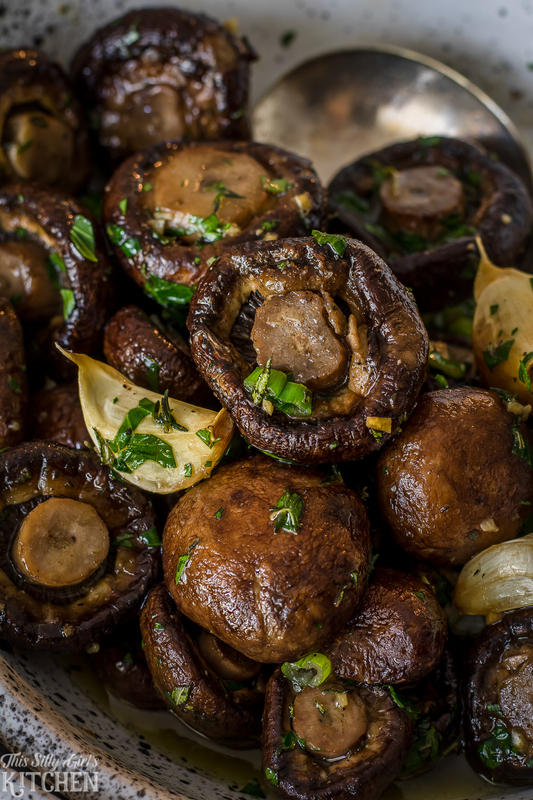 Roasted Mushrooms in a herbaceous garlic butter sauce, steakhouse style! 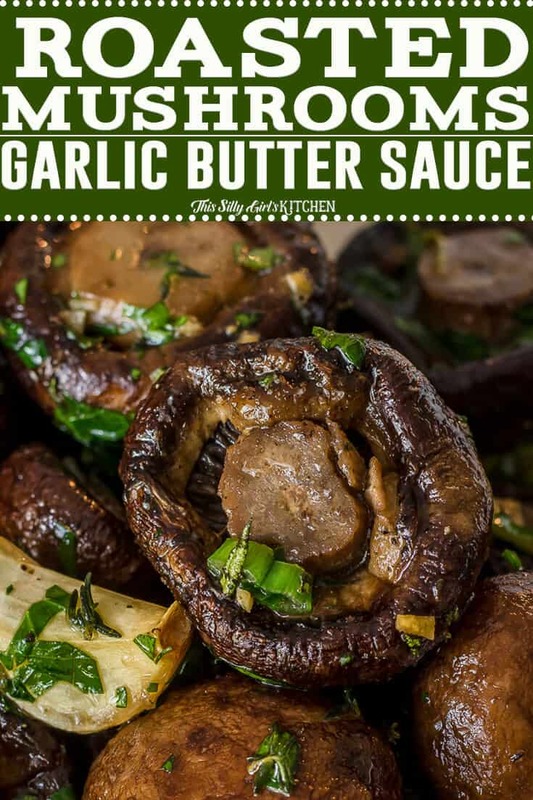 This garlic butter sauce recipe is amazing on these roasted mushrooms, but also goes great on all veggies! 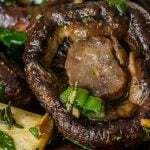 Roasted Mushrooms are a staple side dish every good steakhouse offers. When creating this recipe for Steakhouse Beef Tips with Noodles, I really wanted a good staple side to go with it. And, out popped this oven roasted mushroom recipe! Take me to the recipe for Roasted Mushrooms already! 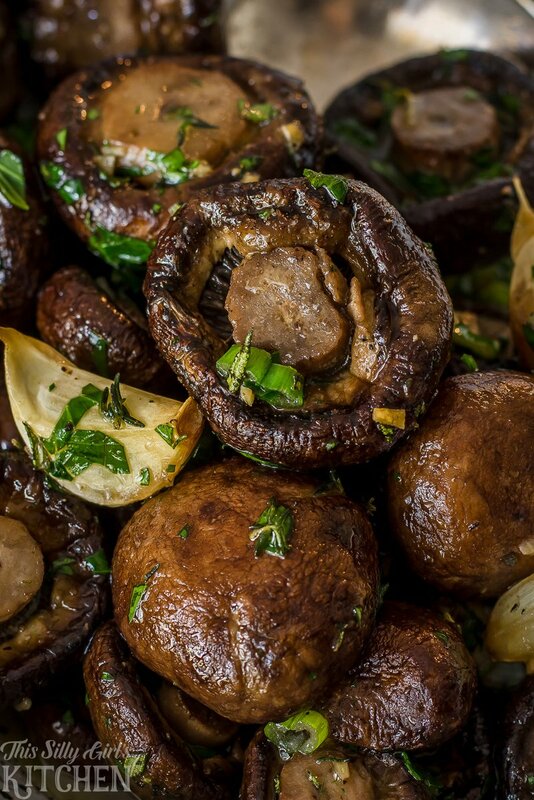 If you would rather not hear my super helpful tips and tricks, FAQ, and my overall awesomeness and get straight to this delicious roasted mushrooms – you can very easily scroll all the way to the bottom of this post for the full printable FREE recipe! Bon appetit. I roasted my portobello mushrooms with a touch of olive oil, some garlic cloves, salt, and pepper. I then toss them in this delicious butter sauce made with lots of herbs and more garlic! This garlic butter sauce goes perfectly with baby bella mushroom recipes, but it is also great for vegetables like cauliflower, broccoli, squash… the possibilities are endless! Clean mushroom thoroughly using a damp paper towel. Trim ends off the stems. 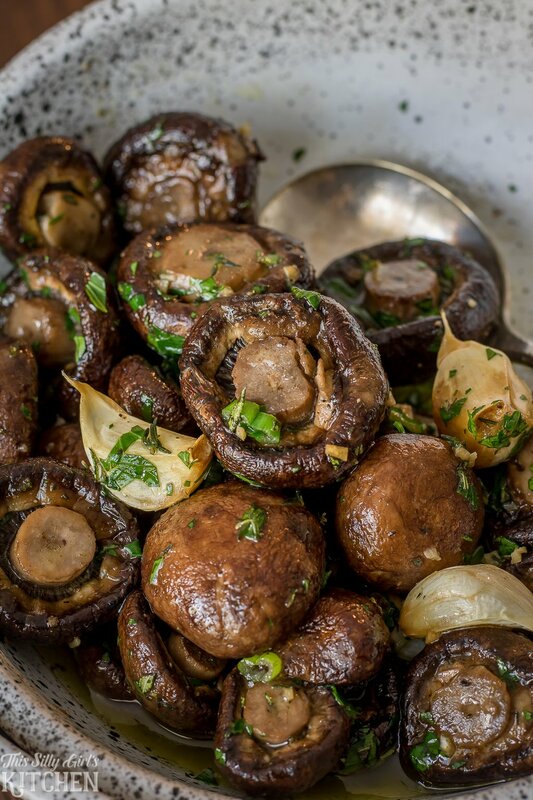 Toss mushrooms in a bowl with olive oil, kosher salt, pepper, and whole garlic cloves. Bake for 20 minutes at 425°F degrees. Flipping halfway through. Make butter sauce consisting of unsalted butter, herbs, and minced garlic. Toss roasted mushrooms in butter sauce, serve and enjoy! Make sure to have some crusty bread on hand to soak up all that butter sauce!! What kind of roasted mushrooms did you use? I used baby bella mushrooms or mini portabella mushrooms for this easy recipe but you can use your favorite button style mushroom in their place. What is your favorite way to eat roasted mushrooms? I have a confession to make… I personally do not like mushrooms. I KNOW! Okay, that’s not entirely true. I love them in a sauce, they give such an earthy flavor to sauces that you can’t duplicate. But, eating them whole… I’ll pass. But, lucky for me, my hubby, Jeremy, is OBSESSED with mushrooms and he was my handy dandy taste tester for this recipe. Husband approved! A loaf of crusty bread is a must when indulging in this mushroom side dish! Swimming in all that melted butter, garlic, rosemary, thyme, parsley, and scallions… you can’t go wrong! Why did you roast the mushrooms with whole garlic cloves? 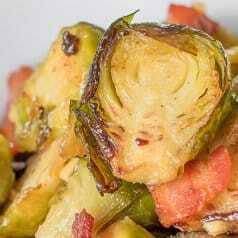 I really wanted this side dish to have a rustic charm to it. Roasting the mushrooms with whole garlic cloves not only permeate the mushrooms while baking but it adds such a nice aromatic to the dish. If you don’t like the way it looks or if you don’t want to eat around the garlic cloves, leave them out. No biggie! Sheet Pans. I keep a variety of different sheet pan sizes on hand at all times. 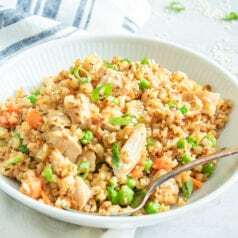 This is the one I used for this recipe. Small pan. Perfect for making our butter sauce! Preheat oven to 425°F degrees. 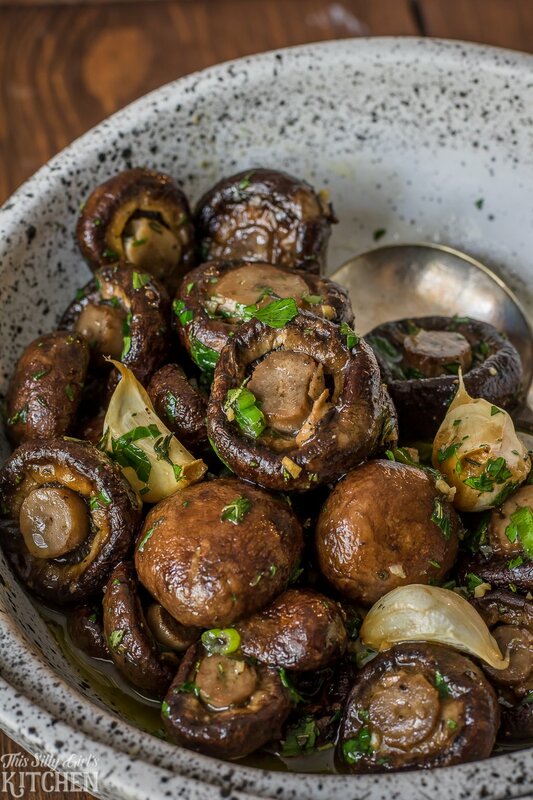 Toss mushrooms with olive oil, salt, pepper, and whole garlic cloves. 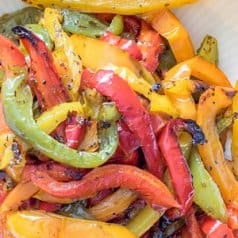 Place on a sheet tray in a single layer and roast for 20 minutes, flipping once at the 10-minute mark. While the mushrooms are cooking, make the butter sauce. In a small skillet, melt the butter over medium-low heat. Add in the garlic and cook until aromatic and slightly toasted, about 3 minutes. Garlic should not brown. Add the rosemary and thyme and cook until aromatic, about 1 minute. When mushrooms are done cooking, place in a large bowl and toss with the butter sauce. Add in the additional herbs and combine. Taste, adjust seasoning if necessary. I just bought some mushrooms to go with my steak for dinner, this recipe is going to be the perfect side dish! These mushrooms sound earthy, delicious, and OMG garlic & butter pairing for the win!